moneysavingexpert.com is running an exclusive discount code – with free champagne – for No 1 Lounges this week as you may have seen in their weekly newsletter. However, this is not necessarily the best deal as I show below. 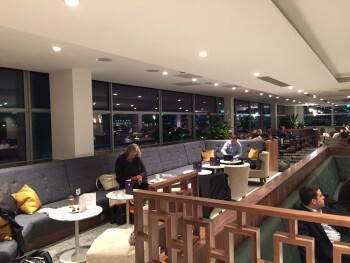 No 1 Lounges has a generous tie-up with Virgin Flying Club. This allows you to buy access to their lounges at a discount and earn points in avios.com or Virgin Flying Club at the same time. Note that their previous Avios deal has now ended. moneysavingexpert is offering a saving of up to 20% PLUS a free glass of champagne per person. You can also book Gatwick’s Clubrooms for £36 per person (normally £45). These offer unlimited champagne, a la carte dining and premium security. This offer must be booked by midnight on Thursday 10th May, for lounge visits up to 31st August. You must book via this special page of the No 1 site and use code MSESUMMER at check-out. Virgin Flying Club offers a discount and, instead of a glass of free champagne, a chunk of miles instead. You also receive fast-track security at Birmingham, Edinburgh and Gatwick. You can only book the Virgin deal via this page of the No 1 website. Because the miles are awarded per booking, you should make a separate reservation for each person in your group. If you are looking at Birmingham or Edinburgh, you are probably better off with the MSE deal. It is £3 cheaper and, whilst you miss out on 350 miles, you do gain a glass of champagne. For the No 1 Lounges and Clubrooms in London, there isn’t much in it. MSE costs £1 more than Virgin and comes with a glass of champagne. Virgin comes with 350 miles (400 for Clubrooms). For the cheap and cheerful My Lounge at Gatwick North, the Virgin deal is your only option. £12, with 200 miles, is a very decent deal I think. I was at Gatwick South early this week with my priority pass. I headed out to the No.1 lounge but as many had said they turned me away as I had not pre booked. They did though offer me the Clubroom for a fee of £15 with the unlimited champagne. Im flying out of south in a few weeks and wanted to use this lounge with PP . I have read this a lot about people getting turned away , but i’m not up for the idea of pre paying £20 to book the 4 of us . Luckily its a morning flight and wanted the lounge as a quite place and not a place to eat and drink so dont think its worth the £20 . I’ve done the Flying Club deal at Gatwick for the Clubrooms a couple of times. Nice lounge. Good service. Ok food and champagne regularly topped up. The miles didn’t post either time. With the flying club deal how do you get the miles? As you get to the payment page without putting your membership number in. It asks for FC number at page where you choose the airport/lounge. Hmm… I’ve just looked everywhere and couldn’t see anywhere to enter a FC number either…! Does anyone know if you can use Nbr1 with the Avios Loungepass deal? It is on LoungePass, so should be ok.
Just in Gatwick No1 North today flying to YYC, first attendant said full to PP but could wait for 30-45 mins on the sofas next to reception. I said no probs as I had some work to do. About 40 mins later her colleague said I had to leave the area. I explained what her collaugue had said, to which she suddenly became a little hostile and said if I didn’t leave she would call security! I said fine, but I would like to see her supervisor at the same time. Not surprisingly the shift supervisor came and found space in the lounge. They really need to sort this out. Aspire and No1 at T5 have a much better system when full. Anyone else had a similar situation? The only way I can rationalise that is that the attendants get a lot of people trying it on, so perhaps she jumped to an erroneous conclusion that you were doing the same. ‘I’m going to call security’ is so clichéd too!